The number of protein isoforms in proteomes can be two to three orders of magnitude higher than the number of genes in the genomes. This is in large part due to posttranslational modifications of proteins that provide covalent alterations to protein backbones and side chains that increase proteome complexities. Greater than 5% of the genes in the human genome encode enzymes that perform such modifications, including hundreds of protein kinases and opposing phosphatases, ubiquitinyl ligases, acetylases and deacetylases, methyl transferases and glycosyl transferases. 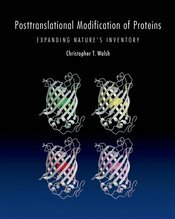 The major classes of posttranslational modifications (PTM) are codified according to types of residues modified, underlying chemistry, PTM catalysts, and biological consequences. This is the first comprehensive treatment of this burgeoning area of proteome diversification.